An author press kit can be a single sheet that covers the basics about you as an author or highlights one specific book. You may also hear them referred to as media kits. The main purpose of a media kit is to present yourself and your book as concisely and as professionally as possible, complete with “how to order” information, which bookstores and libraries will consider must-have information. 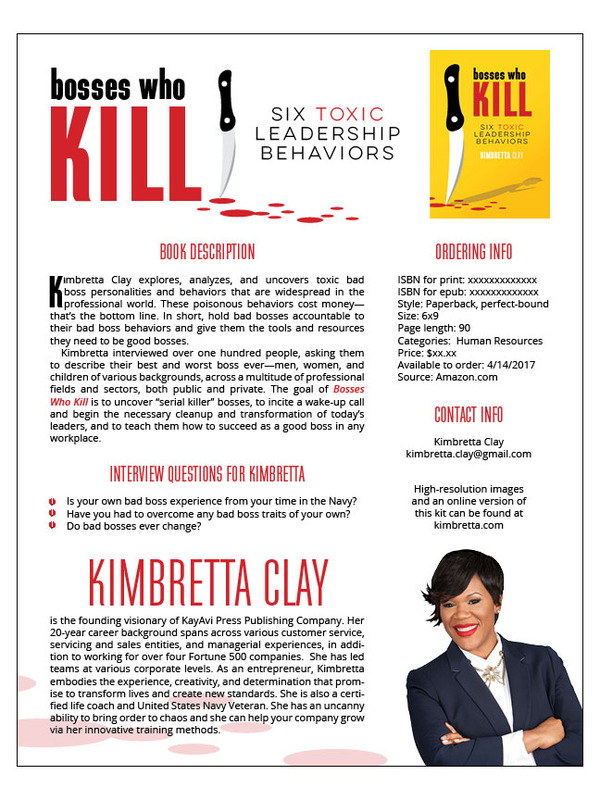 I used Sandra Beckwith’s guidelines from her “How to Create an Online Press Kit” article to build Kimbretta Clay’s single-sheet press kit for her book, “Bosses Who Kill: 6 Toxic Leadership Behaviors”. A second page would be a great place to add in a fact sheet, tip sheet, and quiz focused around her book’s topic. But for the sake of ease and simplicity when Kimbretta is doing in-person marketing, we kept the press kit to one page. 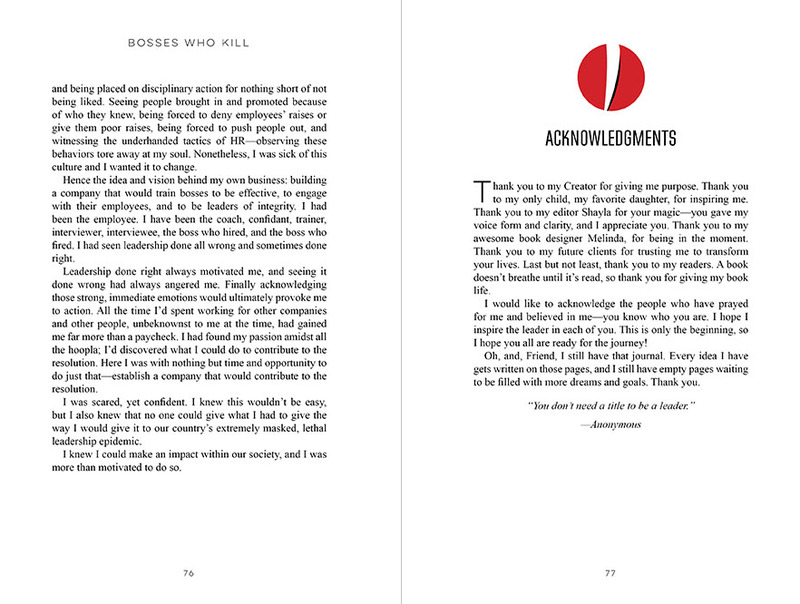 When she’s ready to pound the pavement, she prints off her high-res PDF, grabs a sample print copy, and off she goes. It’s important to note that, as her book designer, I had direct access to her original design files. You can imagine how difficult it would be if I had only had the front cover to extract elements from. If you don’t have access to your original design files, make that a priority today. As a rule of thumb, don’t work with a designer who is not willing to give you the design elements or at least a link to 1) the stock photography that she used and 2) the font names that she used. I provide my clients with style sheets, so they can easily share that with other designers who need that information. 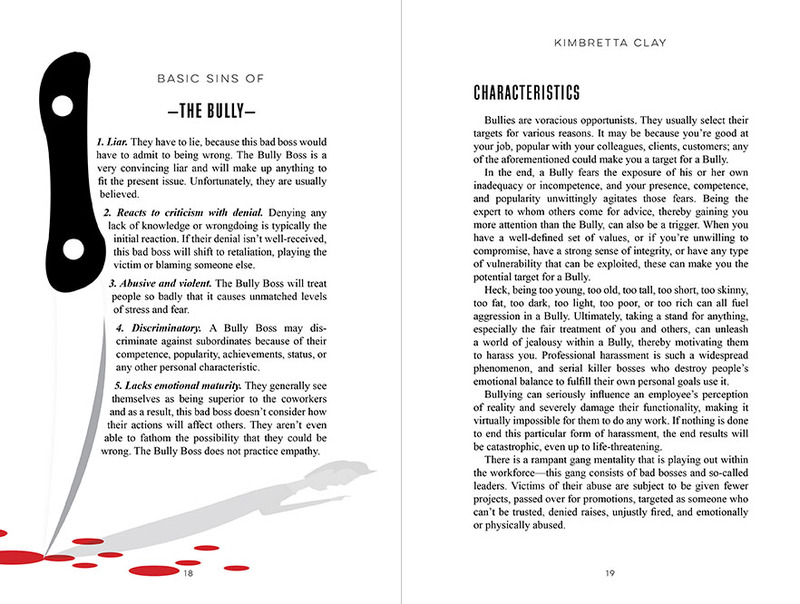 Having come from the corporate world, I have had my fair share of toxic bosses. So when I had the opportunity to work on this project, I jumped at the chance. 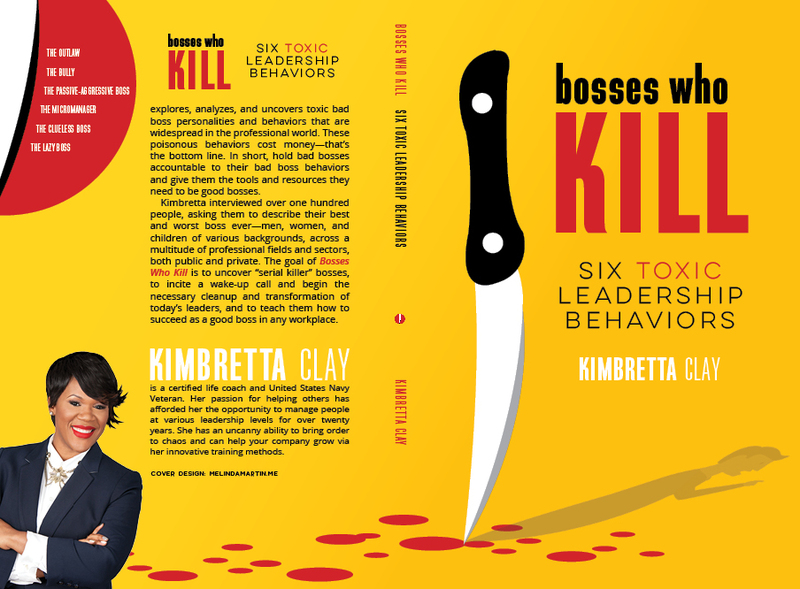 I am very passionate about this subject and highly recommend “Bosses Who Kill”. Here is the full cover and a couple of interior spreads to show how the cover, the interior, and the media kit use a cohesive approach.